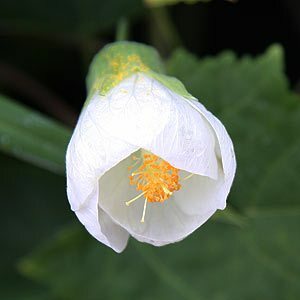 With pure white flowers set against dark foliage and stems that are nearly black make Abutilon “Boule de Neige” a bit of a stunner in the garden. Literally translated we have ‘Bowl of Snow’ and this wonderful white Chinese Lantern earns its name. A hardy variety that will reach nearly 2.5m in height. Grows well in full sun to part shade. This is an evergreen shrub that flowers prolifically from spring to autumn and in some areas throughout the year. The white flowers have a translucency that is a real lift in part shade. Best pruned hard in spring if needed and can be tidied up a little in summer by tip pruning if needed.